Meanwhile, Comsewogue teachers (Port Jefferson Station) were to hear at dawn today whether night-long negotiations had reached a settlement, or whether they would strike. Bill Hippner, spokesman for the teachers said their president, Robert Carr, would call the strike this morning if their was no settlement. The 6:30 a.m. meeting was in the theatre at the Arcade shopping center. As you enjoy your Labor Day weekend, let this article be a good reminder of the courage that our predecessors in the PJSTA showed in order to win many of the benefits that remain in our contract today. On a side note, Bill Hippner’s work for our union continued long after he retired. As recently as this past May he was still serving as the retirement representative on our Representative Council. If you touch base with him at all be sure to thank him for the immeasurable amount of work he did for our union! This entry was posted in General and tagged labor day, PJSTA, strike. Bookmark the permalink. 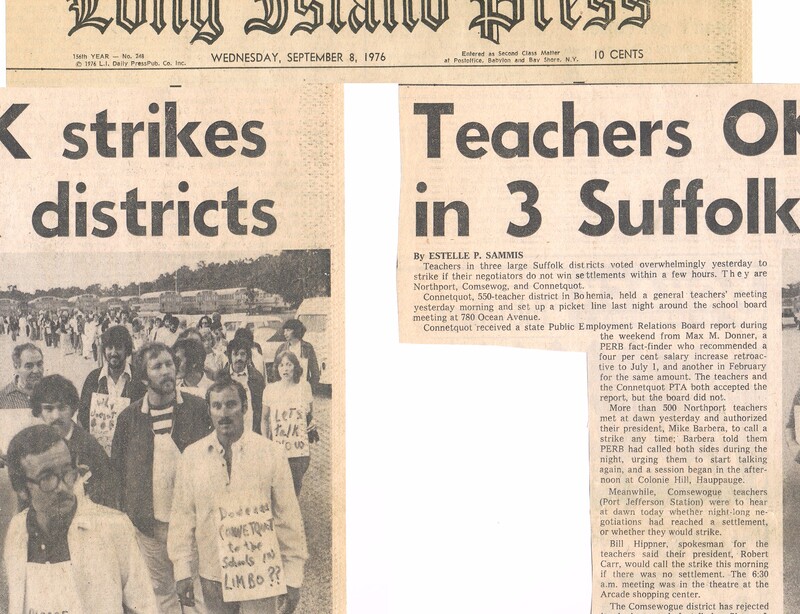 1 Response to PJSTA Flashback: 38 years ago! We stand on the shoulders of those courageous PJSTA women and men who had the foresight to create and fight for our CBA.